To compare Homebuyer survey prices just fill in a few brief details below. It only takes a few seconds for a range of quotes to appear on your screen. This is a completely FREE service and your details are not shared with anyone other than local surveyors providing the quotes. What is a Homebuyer survey? N.B. Not all surveyors are the same! Our members are experienced local chartered surveyors who take care to carry out thorough Homebuyer survey inspections. Mortgage lenders sometimes offer to arrange surveys via large corporate ‘panel’ firms whose surveyors are under pressure to carry out several inspections per day, are generally less experienced, and are not always from the local area. Homebuyer SurveyThis is the most popular type of survey, suitable for the vast majority of homes built since the late Victorian period.The inspection covers the whole property inside and out, from the loft down to the drains (where accessible) and is written on a specially designed RICS report, typically about 10 to 12 pages long.The simple ‘traffic light’ summary makes it quick and easy to read, with each part of the building allocated an easy-to-understand ‘Condition Rating’ of 1, 2 or 3. 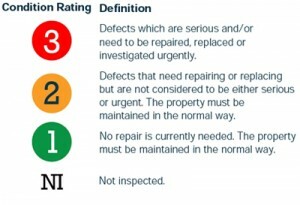 Also known as a HomeBuyer Report (HBR) this will tell you about all significant defects – in fact anything that could materially affect the value. It also alerts you to future maintenance problems. You can even request that the surveyor comments on anything you specially want to know, such as potential for extending or converting the loft.The report can also include a valuation and insurance calculation if required. Carried out by a qualified MRICS or FRICS chartered surveyor.Not normally suitable for older period buildings (ie those built before 1880), unusually large houses, rambling mansions, or properties in need of extensive renovation.